Apart from there being conclusive evidence that asbestos is a dangerous substance introduced into construction many years ago, and subsequently banned some decades ago, it is surprising how much of it is still around on roofs of buildings or part of substructures like gutters and downpipes and even in schools, buildings and homes. 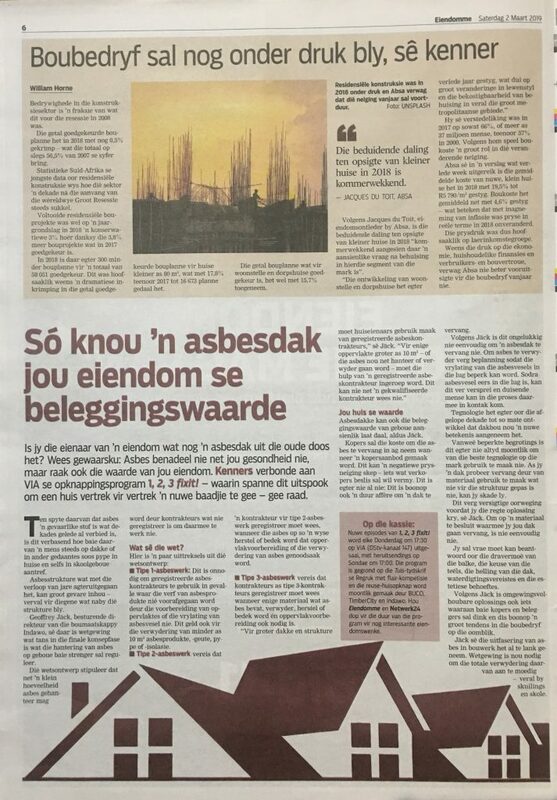 According to building refurbishment company, Indawo, there remain far too many asbestos related structures that have deteriorated to an extent that they are likely to be of significant danger, especially to those near damaged asbestos. 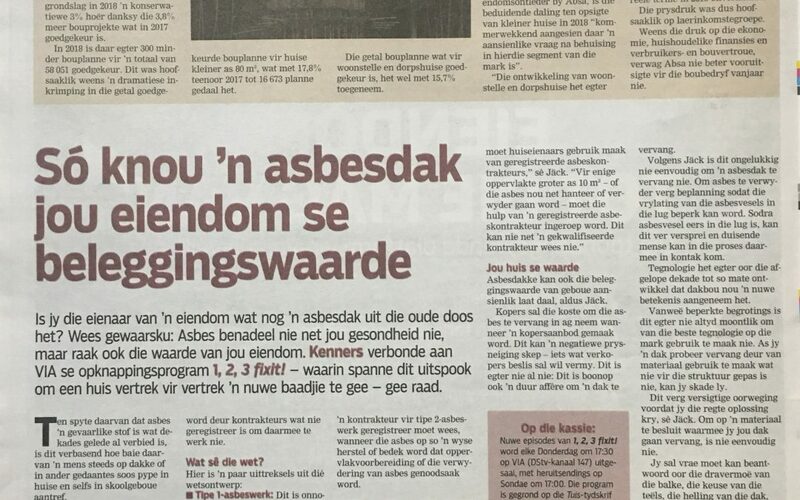 Indawo managing director, Geoffrey Jäck, warns of legislation in final draft stages that will strictly regulate handling asbestos on buildings. The bill provides for a small amount of asbestos that can be handled by contractors not approved as asbestos compliant contractors. Type 1 asbestos work does not require registered asbestos contractors when painting asbestos products excludes surface preparation or cause the release of asbestos fibres, if the removal is less than 10 square metres of asbestos products, gutters, piping or asbestos insulation. Type 2 asbestos work requires registration as a type 2 asbestos contractor when repairing or encapsulating asbestos, in a manner that does not require surface preparation, and the removal of asbestos. Type 3 asbestos work requires contractors to be registered as a type 3 asbestos contractor when removing, repairing or encapsulating asbestos containing material and where surface preparation is required. Asbestos roofs may affect investment values of buildings, significantly reducing their appeal. Investors will consider the cost of asbestos replacement when offering to purchase. This could create a negative price trend, something sellers want to avoid. Jäck says replacing a roof is not as simple as it sounds. Removing asbestos requires planning to limit fibres being released into the air. Once airborne, these travel far and may infect thousands of people, often far from the construction site. With technology advanced to such a degree over the last decade, roofing has taken on a whole new meaning. Largely driven by budget, replacing a roof using materials not suited for the structure could not be the ideal solution. Careful consideration is needed and the right solution selected for the building. The choice of replacement material is not a simple one. Questions to be answered include the strength of supporting beams, choice of tiles, roof coverings or sheeting, pitch of the roof, waterproofing requirements and aesthetics desired. Environmentally sustainable solutions may also be top of mind for many buyers and investors. Jäck says phasing out asbestos in construction has been a long process, some argue, too long. Legislation is needed to fast track its total removal, especially at institutions providing shelter and education to children. Where buildings contain large amounts of asbestos, especially ceilings, removal becomes complex. Extractor fans can safely extract asbestos fibres, interior furniture and fittings need to be covered and materials disposed of according to strict guidelines. Asbestos workers wear protective clothing, covering them from head to toe, which are disposed of daily, making asbestos removal time-consuming and labour intensive. Jäck says replacing deteriorating asbestos is crucial to avoid asbestos related illness from ingesting fibres over time. Indawo can be contacted on 021 941 5000 or email info@indawo.biz.